A first-year welding instructor at Sauk, Roxanne Finneran was always drawn to jobs that were “hands-on.” She earned first her degree in aircraft mechanics and completed her pilot’s license. Before she had an opportunity to use her degree, she moved to Morrison, IL, married, and worked in the family business for many years. A mother of four daughters, Roxanne began taking classes at Sauk for fun and fell in love with welding. “That was my ‘me’ time. I [took classes at Sauk] for me,” shared Roxanne. Roxanne had a natural aptitude for welding and continued to work on a welding certificate at Sauk, while working as a welder in local industry. “There are lots of welding jobs out there. I never had a problem finding a job.” She eventually completed her welding certificate at Sauk by taking mostly night courses to accommodate her day job. As fate would have it, Roxanne was approached to teach Sauk’s basic welding class. As the program expanded, she was hired as a full-time instructor. In Sauk’s new, state-of-the-art welding lab, “We give [students] a lot of one on one time.” It is there that students really gain the skills to be employed as the next generation of welders. 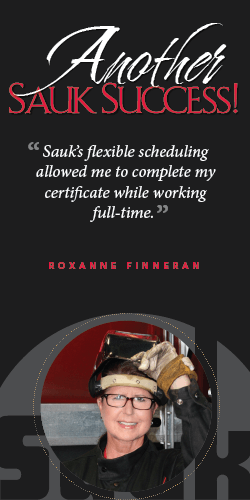 Roxanne exhibits many of the traits we see in our students at Sauk…the ability to complete a degree when working full-time and raising a family, and staying with it despite the hardships. Read more about Roxanne's inspiring story at svcc.mycareerfocus.org.